Dell (NASDAQ:DELL) just released three new workstations, one rack mount and two laptops, and they all pack a bunch of interesting features. While workstations are a category that most people ignore, even for the non-CAD worker, these new machines have a lot to offer. Before we dive in to the details of the hardware, lets define workstation. It is a term that is often abused by people wanting to sell you more hardware than you need at high margins. For this article, we will define the term as a PC that is more expandable, better built, has some ‘server’ oriented components, and most importantly, a list of certifications as long as your arm. The first few items on the list are getting harder and harder to find as cost cutting and reference designs take over the market, so a real workstation class machine is likely worth the premium if you want hardware that lasts. Certifications are one of those things that you either need or probably don’t know exists. What is means is that companies selling software that is normally run on workstations, CAD, modeling, 3D, design tools, and various simulations, all tend to sell or require certified hardware. This means that the hardware is tested to run with their software without problems, and they will support it. You can do without the certifications, but when you have a problem and call support, you might get an answer you don’t want to hear like, “Call us back when you have the same problem on certified hardware.” When you are paying several thousand to tens of thousands of dollars per seat for the software, a little more for the hardware to avoid expensive and time consuming downtime is well worth it. In light of this, the three new machines from Dell are more than just well made and theoretically bulletproof, they come with a higher level of support than normal PCs, meaning 24/7 phone banks staffed by the people you talk to once you convince the flowchart monkeys on normal support that you really do have a clue, and no, rebooting, er, power cycling, won’t fix the problem. Dell acts as a single point of contact for 75 vendors, basically all the hardware and some software too. That alone is worth the extra cash, the MIL-STD-810G construction is just a nice bonus. So, what exactly is Dell launching? Three workstations, the Precision M4600 and M6600 laptops, and the R5500 rack mount thingy that doesn’t fit any common classification. You can read all about them here. The laptops are not really lookers, somewhat square, black, and a complete lack of flashy LEDs and buttons that do nothing more than call annoying software that you can’t seem to get rid of. They are all about business and getting the job done, and that is a good thing. The short story is that both laptops are all iSomethingmeaningless 2nd Generation, IE Sandy Bridge based laptops. There is only one chipset, Cougar Point, and in this case it is fused off to QM67 guise, presumably a B3 stepping. So far so normal. The first thing you notice is that you are not stuck with the usual OS choice, if you don’t want Windows, you can pick Red Hat or Ubuntu, both of which are tagged with a “(select regions)”. If those select regions are the same as the predecessor M4500 and M6500, the US is not one of those regions. It looks like MS still has the best monopoly money can buy, or at least the best monopoly you are forced to fund. 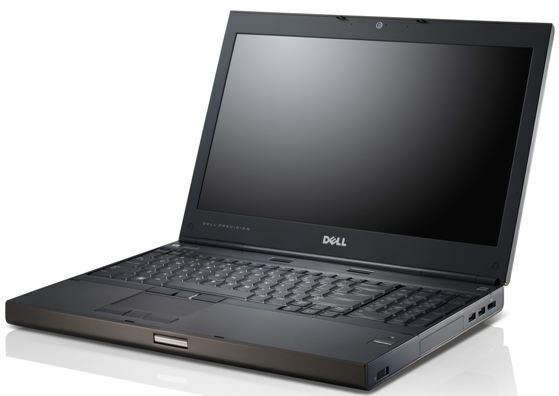 Lets hope when the new models are available next month, Dell comes to their senses here. To make matters worse, XP is no longer available at all, so your bad choices just got laughable. From there, things get much better in a hurry. Remember how I mentioned that the term workstation implicitly means expandable? You know how laptops these days are anything but expandable? Both the Precision M4600 and M6600 are expandable for memory, they have four DIMM slots. This means two things, dual channel memory, and lots of it. You can get either 16GB of DDR3/1600, a speed Dell claims no one else is offering, or 32GB of DDR3/1333. 32GB of DDR3 in a laptop, not a bad place to start. For panels, you have four 15.6″ choices on the M4600, and three 17.3″ options on the M6600. The base M4600 comes with a 1366 x 768 LED backlit panel, with a multitouch or stylus supporting version as an option. Avoid the first like the plague, if it is anything like the base panel in the new Lattitudes, it is so muddy and dark that you have to wonder how Dell put it in their products. The touch screen may be better, but I would not chance it. There are also two 1920 * 1080 choices, a normal and an IPS panel, both with a guarantee of replacement if even one pixel goes bad. On the M6600, all screens have the zero defect guarantee. The base panel is 1600 * 900 with no ‘unique features’, the other two are 1920 * 1080. They come in normal and multitouch/stylus, but not IPS. That is a pity, a 17.3″ IPS panel would look really nice. The screens make me scratch my head a bit, the choice of 16:9 instead of 16:10 is an odd one, you would think that this class of machine would want a real screen, not a cut down variant to save a few bucks. The extra pixels do matter when doing heavy design work, and not even having the option of more is curious, especially in light of the GPU choices. Using a 1366 panel on the M4600 is curious as well, if it is the same as the Lattitude, it simply should not be in this class of machine, nor should a panel that can’t even display some of the default configuration windows on the shipping OS choices without dropping the ‘OK’ buttons off the bottom. SIGH. The more things change, the more things regress to save a few bucks. On the up side, at least these machines offer a really nice set of optional panels, something that can’t be said for some of the Lattitudes. To drive these panels, the M4600 can be outfitted with a FirePro M5950/1G GDDR5, a Quadro 1000M or a Quadro 2000M, both with 2G of GDDR3. The M6600 can have a FirePro M8900 with 2GB GDDR5, a Quadro 3000M or 4000M with 2GB of GDDR5, or a Quadro 5010M with 4GB of GDDR5. See what we mean with 1366 * 768 being silly? Even 1920 * 1080 is a bit tight for a card with a 4GB frame buffer. On the up side, both of the FirePros have Eyefinity, so you can have three active displays on the laptop, five if you use the dock. This is by far the best multi-screen option for a laptop we have ever seen. For storage, you can choose one or two 7200RPM HDs from 250-750GB, plus an optional 128GB card on top of that. If you want, you can also get a 320GB self-encrypting HD in place of the normal versions. It doesn’t take a genius to guess that there will be a bunch of SSDs offered in the near future, but none are out there now. If those storage options aren’t enough for you, you can add more. There are five USB ports, 3 x 2.0 and 2 x 3.0, and one of the 2.0 ports has eSATA as well. Should that not be enough, there is an IEEE 1394 port as well. For graphics, you have VGA, HDMI and Displayport on both laptops, and if you have an AMD GPU, all can be active at once. Although you might have trouble finding them if you fill in all the above ports, there is a multi-card reader and full 54mm ExpressCard slot. If you are still needing more, the docking station will help you overcome these ‘meager’ limits. To take a hard left turn, we move on to the Dell R5500 rack mount workstation. Before we answer the ‘what the he….’ type questions, lets look at the hardware. It looks like an ordinary 2U rack mount server, and sports up to 2 Xeon 5600 series processors and a 5520 chipset. Yes, until Intel releases the high end Sandy Bridge chips, anyone with serious compute needs is going to stick with the last generation Westmere parts. These chips are more than powerful enough, and don’t have their PCIe lane counts crippled for marketing reasons. You can pick any 4 or 6 core variant up to 130W for the R5500. On top of that, Nehalem and Westmere CPUs had three memory channels, so you can put in up to 12 DIMMs. The R5500 will support up to 192GB of DDR3/1333. As with the servers in the same chassis, you can put in five 2.5″ HDs from 1TB SATA to 146GB 15K SAS drives, with a lot of choices in between. On the GPU front, you can choose from a number of Quadro GPUs, the R5500 has two full PCIe 16x slots, and can put a high end GPU in both. Officially, you can put in 450W of GPUs, but we are not sure if that is actual Watts or Nvidia ‘Fermi-Watts’. If it is Fermi-Watts, you might want to spring for the redundant PSUs and a few Halon fire extinguishers close by just in case. A data-center version of the GTX590 is unlikely to endear Dell or Nvidia to many data center managers. The last part is the most interesting, an optional PCoIP card, basically a Teradici chip on a board. If you aren’t familiar with PCoIP, it is the standard that Teradici made for desktop virtualization, and has since become the standard for almost anyone doing virtualization. You can connect to it with lots of software stacks, but the hardware version has some obvious advantages. That brings us back to the “what the he….” question, basically why would you want to have a rack mount workstation? The cons are pretty obvious, most desks don’t have a rack beside them, and rack servers are noisy beasts. Putting a workstation in a remote rack means you are doing some kind of remote access, and that usually means pain, lag, annoying quirks, and user frustration. Why would any sane person want this? The first reason is the Teradici chip, it takes a huge chunk out of latency, and makes remote access much more tolerable and smooth. If done right, a desktop thin client should have all the ports available to the standard workstation, multiple monitors, and full access to everything. Hardware compression and decompression is not magic, and will still not change the laws of physics, so you will still see some lag. If you are in the same building as the server, this should be minimal, probably not noticeable unless you are quite sensitive to minute latencies. Some people are, more people claim to be, and most won’t notice at all. Having seen 1080p video and 3D games streamed over a similar solution, it is pretty seamless. In exchange for a bit of lag, the user gets two benefits. The most obvious is that they don’t have a huge workstation to bash their knees against, just a tiny little PCoIP box. To make things better, they could also access the same workstation from home or anywhere they are with sufficient bandwidth. Latency will obviously go up, but if you need to do some heavy lifting with graphical output in the field, it sure beats carrying around a full tower with a glued on handle. On the IT management side, the benefit list gets even longer. The most obvious one is data leaks, the computer is safely locked away in a room that can be locked down and heavily guarded. That is a lot harder to do in a cube farm. The Teradici chip also has a host of security features, including remote USB connectivity, and the removal thereof. If you are afraid of your blueprints walking out the door with an employee or worse yet some random evil doer, the R5500 makes a lot of sense. Another common scenario is having shared workstations and pools of high powered hardware for occasional use. You could have a worker log in to a 3D powerhouse when they are working on a project, and a normal PC when they are doing less demanding tasks. With Linux, this is easy enough, and Windows is finally starting to catch up if you buy the right tools. It should be fairly painless to the user if IT is on the ball. Splitting a workstation between offices on opposite sides of the world has lots of promise too. This once again has the caveat of ‘if done right’, the other option is too horrific to consider.